Oct.16th 6-7:30 pm – First practice and Parent meeting. 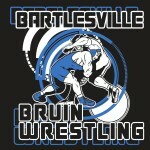 Practices will be held at the High school wrestling room located on the old field house on Monday, Tuesday and Thursday. $65 – singlet deposit (refunded at the end of the season when singlet is returned). Contact Brian Hainzinger 918-914-2505, Casey Evan 405-496-0491 for additional information.